When I came across the unusual name of Byrl Raitt in Iowa, I thought I’d try and find out more about this family. As I progressed backwards through his ancestors with a view to creating an Iowa Raitt page, I realized that the family stemmed from the Maine Raitts! Then a very recent request from someone for details about her family (father Ellwood Allen Raitt) prompted further research and it appears they too are from the same stock as the Maine Raitts - though some have since moved on to Minnesota (see under this state on the American Raitts page)! So instead of starting with Byrl and going backwards, I shall start from the other end - with a little background from the Maine Raitts - and come forward! The earliest in the Maine Raitt line is Captain Alexander Raitt. It is not known yet precisely when he was born in Scotland or who his parents were. He died, however, in 1776 in Jamaica, West Indies. He married Miriam Frost on 2 October 1747 in New Castle, Rockingham, New Hampshire. She was born on 8 October 1722 in New Castle and died on 3 June 1807 in Durham, Strafford, New Jersey. Her parents were the Honourable John Frost and Mary Pepperell, both of Kittery, who had a total of 15 children between 1703-1726. John’s father Charles came from Tiverton, Devon, England. Alexander and Miriam had seven children: Alexander (1749), James Straten (1751), William (1753), John (1755), Andrew (1757), Mary (1761) and Miriam (1762). William Raitt was born on 22 April 1753 in Kittery, York, Maine and he died in Eliot, York on 8 September 1834. His father was Captain Alexander Raitt and his mother was Miriam Frost. William married Sarah Leighton on 16 December 1773 in Eliot. She had been born in Kittery on 12 November 1753 and died in Eliot on 16 February 1828. The couple had nine children between 1774-1795: Isabella (1774), Elizabeth (1777), James (1779), Mary (1781), John (1784), William (1787), Miriam (1790), George (1792) and Olive (1795). Of their sons, apart from George nothing much is yet known about them and their families. James was born on 4 April 1779 in Kittery; John was born on 16 July 1784 in Eliot and died there on 28 August 1860; William was born on 22 January 1787 in Kittery and died on 5 November 1868. George Raitt was born in Eliot, York, Maine on 1 July 1792. He married Eliza Daffern Hamilton on 2 October 1820 in Eliot. Eliza was born on 7 February 1796 in North Yarmouth, Cumberland, Maine. She died in Eliot on 19 October 1848, while George died on 29 November 1859 in McGregor, Clayton, Iowa. The couple had three children all born in Eliot: Elizabeth, in 1824; Oliver, in April 1826; and George, in 1834. Sometime between April 1857 and November 1859, George Snr and sons Oliver (and new wife Martha) and George Jnr (possibly with a wife, Maria - see below) moved from Maine to Iowa. It is not yet discovered whether Elizabeth went with them. It is possible she had married and remained in Maine - but I have yet found no records of her marriage anywhere or her death. In the 1850 census for Elliott, York, Maine we have George Raitt, 58, farmer; daughter Elizabeth, 26; and son George, 16, farmer - all born Maine. Oliver Raitt was the eldest son of George Raitt and Eliza Daffern, born in April 1826 in Eliot, York, Maine. 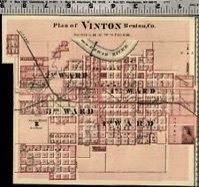 He died in in Worthington, Nobles, Minnesota on 8 November 1873. Oliver Raitt of Kennebec, age 23, married Nancy H. Torr, 22 (born 24 May 1827 at Salem (near Danvers), Essex, Massachusetts) on 6 August 1849 in Danvers. Nancy was the daughter of Andrew Torr and Clarissa Stevens. She died 19 September 1850, aged 23, in Maine. Oliver then married Martha Ann Kimball in Kennebunk, York, Maine on 17 April 1857. Martha had been born in Kennebunk on 3 March 1842 - she died on 9 July 1911 in East Waterloo, Blackhawk, Iowa. They had three boys: William, born Iowa about 1858, who died young it seems; Charles W. born in Clayton, Iowa in July 1861 and then a second William born there in 1865. In the 1850 census for Kennebunk, York, Maine Oliver Raitt, age 24, tanner, born Maine, is living with his wife Nancy, 23, born Maine. In the 1860 census for McGregor, Clayton, Iowa there is Oliver Raitt, 32, tanner, born Maine; wife Martha, 18, born Maine; son Willie, 2, born Iowa; brother George, 25, mason, single, born Maine; and mother-in-law Betsey Kimble, 53, born Maine. 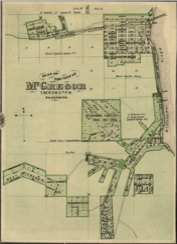 On 1 July 1863, age 37, residence McGregor, Oliver Rait (sic), born Maine, was registered for military duty. His occupation was given as stave (stone?) cutter. Unlike his brother’s record on the same day, it does not state that he was married. In the 1870 census for Mendon, Clayton, Iowa there is Oliver Raitt, 43, farmer, born Maine; wife Martha, 26, keeping house, born Maine; and sons Charles, 9; and William, 5 - both born in Iowa. In the 1880 census for Mendon, Clayton, Iowa there is Martha A. Prapert, 38, farmer, suffering from dropsy, born Maine as were both parents; children Charles Raitt, 19, farmer; William Raitt, 15; Ray Prapert, 3; and Martha Prapert, 5m. All children born Iowa, both parents born Maine. Martha is (re)married and seems to be head of the household. 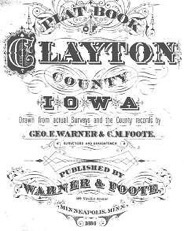 In the Iowa State Census for 1885 living in Mendon, Clayton is M. A. Probert, 41, born NY; and children Chas Raitt, 24, labourer, born Clayton; Wm Raitt, 21, labourer, born Clayton; Raymond Probert, 6; and Martha Probert, 4. All children born Iowa, both parents born Maine. Martha is married and seems to be head of the household. George was the youngest son of namesake father George and wife Eliza Daffern. He was born in Eliot, York, Maine in 1834 and died in Crystal, Hennepin, Minnesota in March 1870. 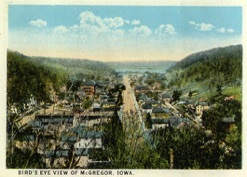 Along with his father and brother, sister-in-law, and possibly his own wife, he moved from Maine to Iowa sometime between April 1857 and November 1859. In the 1850 census for Elliott, York, Maine we have George Raitt, 16, farmer, living with his father George Raitt, 58, farmer; and sister Elizabeth, 26 - all born Maine. In the 1860 census for McGregor, Clayton, Iowa George Raitt, 25, mason, single, born Maine is living with his brother Oliver Raitt, 32, tanner, born Maine; the latter’s wife Martha, 18, born Maine; and their son Willie, 2, born Iowa; also in the household is Martha’s mother, Betsey Kimble, 53, born Maine. On 1 July 1863, George was registered (as George W. Raith) for military duty. He was aged 29, born Maine, and residing in Allamakee County, Iowa. His occupation appears to be lumberman and it states he is married. George moved to Minnesota between 1863 and 1870 for he appears in the 1870 census for Crystal Lake, Hennepin under Schedule 2: Persons who died during the year ending 30 June 1870. His age was given as 36, he was married and he was born in Maine. He died of consumption. His occupation appears to be stone manufacturer. His home seemed to be Excelsior, Hennepin. He presumably married between 1860 and 1863, while still in Iowa. However, a search for any female called Raitt in Excelsior, Hennepin revealed Maria Raitt, aged 28, born Maine. Unfortunately the census page is totally unreadable, so no further information can be gleaned. She does not appear to be in the 1880 census there, so probably she remarried. However, if she was born in Maine (about 1852) then it is more than likely that she met and possibly married George there - i.e before they moved to Iowa. And that she then accompanied George, his brother Oliver (plus wife) and their father George Snr, when they relocated from Maine to Iowa. However, she does not seem to be in the 1860 census with him and George appears not to be married in 1860. Charles was the eldest son of Oliver Raitt and Martha Kimball, being born in July 1861 in Clayton, Iowa. He married Esther Caroline Adney on 30 March 1888 in Crawford Co., Wisconsin. Esther had been born on 16 November 1865 in Bradford, Stark, Illinois to John Taylor Adney and Sarah Ann Oxberger. Charles and Esther had several children: Oliver Ramen (born 29 Oct 1887, died 12 Jan 1959), Alice C. (1889), William Charles (born 18 July 1891, died July 1975), John G. (Jack) (born 29 Jan 1893, died Dec 1979), Mary Elizabeth (1894) and Clara Edna (born 18 Aug 1898). Following the death in childbirth of Esther on 25 June 1901 in McGregor, Clayton at the age of 36, Charles married Francis Allie Hughes (born October 1864 in McGregor, died 30 January 1917 in Fergus Falls, Otter Trail, Minnesota) on 28 May 1902 in North McGregor, Clayton, Iowa. At the time, Charles W. Raitt, age 42, was a farmer, born and residing in North McGregor and wife Allie Hughes (née Evans), age 38, and residing in McGregor. The record marriage stated it was Charles’s second marriage and that his parents were Oliver Raitt and Martha Kimbale. It was Allie’s third marriage and her parents were John W. Hughes and Harriet A Husbands. Their son, Ellwood Charles, was born in 1904. Charles died in December 1920 in McGregor, Clayton, Iowa. Interestingly, his grave in Knapp Cemetery, McGregor (apparently built by his mason son Jack) gives his name and that of first wife (Esther) Caroline rather than more recent wife Francis. Apparently, after the death of Esther, all the children of the marriage between Esther and Charles were sent to live with different relatives. In the 1870 census for Mendon, Clayton, Iowa there is son Charles, 9, born Iowa living with his parents Oliver Raitt, 43, farmer, born Maine; and mother Martha, 26, keeping house, born Maine; and younger brother William, 5, born Iowa. In the 1880 census for Mendon, Clayton, Iowa there is Charles Raitt, 19, farmer, born Iowa, wiving with his remarried mother Martha A. Prapert, 38, farmer, suffering from dropsy, born Maine as were both parents; his brother William Raitt, 15; and two half-siblings: Ray Prapert, 3; and Martha Prapert, 5m. All children born Iowa, both parents born Maine. 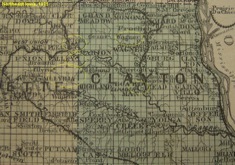 In the Iowa State Census for 1885 living in Mendon, Clayton we have Chas Raitt, 24, labourer, born Clayton living with his mother M. A. Probert, 41, born NY; and siblings; Wm Raitt, 21, labourer, born Clayton; Raymond Probert, 6; and Martha Probert, 4. All children born Iowa, both parents born Maine. The Iowa State Census for 1895 has Charles Rait (sic), age 34, born Clayton, Iowa residing at Mendon, Clayton. In the 1900 census for Mendon, Clayton, Iowa we find Charles W. Raitt, age 38, farmer, born Jul 1861 in Iowa, both parents born Maine, married to Esther C. Raitt, 34, in 1887 (thus married 13 years), born Illinois (as father, mother Ohio); stepson Clarence, 14, teamster, born Wisconsin (father born Wisconsin, mother Illinois); and children Oliver, 12, at school; Alice, 10, at school; William, 8; John, 7; Elizabeth, 5 and Clara, 1 - all born Iowa. Stepson Clarence Raitt was born in February 1886 in Wisconsin, but does does not seem to be under that name in subsequent censuses. It appears that he was the son of Esther’s first marriage to John McMillan (various spellings). In the 1910 census for Mason Ward 4, Cerro Gordo, Iowa we find Chas W. Raitt, 49, burner in a clay works, born Iowa (father born New York, mother Indiana); wife Francis A. Raitt, 43, born Iowa (father New York, mother Kentucky); son Chas E., 5, born Iowa; and sister-in-law Amy Evans, 17, born Iowa (father New York, mother Kentucky). In the 1915 Iowa State Census, there is Charles Raitt, 54, married, residing at McGregor, Clayton, born Iowa (both parents born New York) In the same census, son Oliver Raitt, age 27, single, born Iowa (father Iowa, mother Wisconsin) is residing at Ludlow, Allamakee and working as a farm labourer. Charles does not seem to be in the 1920 census. William was the youngest son of Oliver Raitt and Martha Kimball and born in 1865 in Clayton, Iowa. He appears to be named after Oliver and Martha’s firstborn son, named Willie and aged 2 in the 1860 census - thus born about 1858. Willie must have died in the early 1860s. William II seems also to have been destined to die early - his death is recorded as 15 December 1886 in Clayton, Iowa. In the 1870 census for Mendon, Clayton, Iowa William Raitt is 5, born Iowa living with his father Oliver Raitt, 43, farmer, born Maine; mother Martha, 26, keeping house, born Maine; and brother Charles, 9, born Iowa. In the 1880 census for Mendon, Clayton, Iowa William Raitt is 15 living with his mother, now Martha A. Prapert, 38, farmer, suffering from dropsy, born Maine as were both parents; his brother Charles Raitt, 19, farmer; and half-siblings: Ray Prapert, 3; and Martha Prapert, 5m. All children born Iowa, both parents born Maine. The same family is living in the same place in the Iowa State Census for 1885. M. A. Probert, 41, born NY; and children Chas Raitt, 24, labourer, born Clayton; Wm Raitt, 21, labourer, born Clayton; Raymond Probert, 6; and Martha Probert, 4. Oliver was the eldest son of Charles W. Raitt and Esther Adney and poresumably named after his paternal grandfather. According to his draft registration details for both WW1 and WW2 his date and place of birth was given as 29 October 1887 in McGregor, Clayton, Iowa - though there seems to be a query over the date and it may have been 1888. He died on 12 January 1959 in Freeport, Winneshiek, Iowa. The Iowa State Census for 1905 has Oliver Raitt residing at Grand Meadow, Clayton, Iowa. In the 1910 census for Post, Allamakee, Iowa Oliver Raitt, age 22, is a farm labourer. In the 1915 Iowa State Census, Oliver Raitt, age 27, single, born Iowa (father Iowa, mother Wisconsin) is residing at Ludlow, Allamakee and working as a farm labourer. In the 1920 census for Frankville, Winneshiek, Iowa we have Oliver R. Raitt, 34, single, a hired man working as a farm labourer. 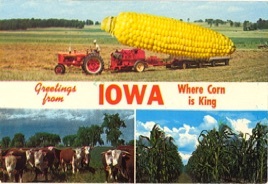 His father’s birthplace was given as Iowa (like his) and his mother was from Wisconsin. In the 1930 census for Frankville, Winneshiek, Iowa we have Oliver Raitt, 43, single, working as a farm labourer. He is a lodger with e same family as in 1920 - his father’s birthplace was said to be Scotland and his mother’s Illinois. In the 1940 census for Decorah, Winneshiek, Iowa, Oliver Raitt, 52, is still single and a lodger at 601 Day Street with the same family as in 1920 and 1930. His occupation is given as Other. He was at the same address in 1935..
On his WWI Draft Registration Card dated 5 June 1917, Oliver Ramen Raitt was born on 29 Oct 1887 in McGregor, Iowa. 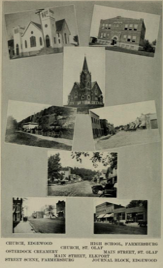 His home was listed as R3, Frankville, Iowa and he was a day labourer in Ludlow. He claimed exemption due to doubt of age. He was tall, medium build, with light blue eyes and light hair. On his WWII Draft Registration card dated 1942, Oliver Raymond Raitt, living at 603 Day Street, Decorah, Winneshiek, Iowa, was aged 54, born 29 Oct 1887 in Clayton Co., Iowa. He was self-employed and the person that would always know his address was John Raitt of Vinton, Iowa. This is presumably his brother John. William Charles Raitt, second son of Charles and Esther Raitt was born on 11 May 1891 in McGregor, Clayton, Iowa and died in Baltimore, Maryland on 31 July 1956. He married Elva Ressler, born 24 September 1900 in Shell Rock, Butler, Iowa, on 20 February 1917 in Bison, Perkins, South Dakota. On the marriage extract, his age was given as 25 and his residence was Bentley, Hettinger, North Dakota; Elva’s age was 16 and her residence was Watrus, Hettinger, North Dakota. Elva was born to Herman and Ida Ressler and she died on 19 July 1962 in Baltimore, Maryland. Her family clearly moved North Dakota after her birth and before 1910 when they appear in the 1910 census for Township 133 in Hettinger. Quite why William was in North Dakota in 1917. The couple had three daughters (the eldest born in Soth Dakota, and the second in North Dakota) and two sons. About 1920 the family moved to Baltimore, Maryland, where son Herman Jacob was born on 9 February 1921. Herman married Anna Minnie Bodine (born 1924 in Baltimore) about 1942 and their son Herman Jacob Raitt, Jnr was born on 2 June 1943 in Baltimore and died in Colora, Cecil, Maryland on 5 Jul 2010; their other son William Charles was born in Baltimore on 12 Oct 1945 and died in Wharton, Texas on 16 March 2005. Herman Jacob Snr died on 23 August 1995 in Baltimore. The draft WW1 registration card for William C. Raitt was dated 5 June 1917 in Bentley, Hettinger County, North Dakota. His date and place of birth was given as 11 May 1891 in McGregor, Iowa and he was a self-employed farmer in Bentley. He had served three years in the Cavalry as a private and was seeking exemption from the draft because he had a wife to support. He was tall and stout with blue eyes and light coloured hair. In fact in the US Army Register of Enlistments, the record showed he had enlisted in 1910 at Fort William McKinley, Philippine Islands, for three years. His occupation was soldier. Besides his blue eyes, flaxen hair and fair complexion, we learn his height was 5 ft 8 and 3/4in. His regiment was the Cavalry, A Company - he served two enlistments and was discharged first on 15 November 1910 and then again on 19 June 1911. He was registered again for the draft in WW2 on 26 April 1942 aged 49 (his date of birth was given as 11 May 1892). His residence was 1720 Alice Anna Street, Baltimore, Maryland. He gave, as a person who would always know his address, George Jensen, Route 10, Sparrows Point, Maryland 9i wonder why he didn’t give his wife?) He was a self-employed contractor working from home. It seems the colour of his eyes had changed from blue to brown (!) and his hair was brown. He was 5ft 8in tall, weighed 162 pounds and had a ruddy complexion. He had a scar on his left arm starting at the wrist and also an abdominal scar. In the 1900 census William Raitt, age 8, born Iowa was at home with his parents and siblings in Mendon, Clayton, Iowa - father Charles W. Raitt, age 38, farmer, born Jul 1861 in Iowa, both parents born Maine; mother Esther C., 34, born Illinois (as father, mother Ohio); siblings: Clarence, 14, teamster, born Wisconsin (father born Wisconsin, mother Illinois); Oliver, 12, at school; Alice, 10, at school; John, 7; Elizabeth, 5 and Clara, 1 - all born Iowa. In the Iowa State Census for 1905, William Raitt is 14, living in Clayton, Iowa. In the 1910 census, William C. Raitt, age 21, was a soldier stationed at Fort William McKinley, Rizal, Philippine Islands in Troop A 12th Cavalry. He had been born in Iowa, but for some reason both his parents were given as born in Germany! The 1920 census for Election District 15, Baltimore, Maryland has William C. Raitt, 28, born Iowa (as both parents), pipe fitter in a ship yard, living at 5 Baltimore Street, with his wife Elva, 19, born Iowa (as both parents) and daughters Violet, aged 2y 3m, born North Dakota; and Gladys, aged 7m, born North Dakota. Since Violet is not in later censuses I presume she died. In the same election district in the 1930 census but now living at 265 Geiss Avenue, Baltimore, we have William Raitt, 38, carpenter in house building industry; wife Elva, 29; daughter Gladys, 10, born ND; son Herman J., 9y 2m; daughter Clara C., 7y 7m; and William, 6 - the last three children all born Maryland. In the 1940 census for Baltimore City, Maryland, we find William C. Raitt, 57, married, a builder, living as a lodger at 1533 Aliceanna Street. With him is his son William C. Raitt Jr, 15, born Maryland, employed as an unpaid family helper. They had been at the same address in 1935. Wife Elva, 39, married and head, is working as a trimmer in a packing house, and living at 79 North Dakota Avenue, Edgemere, Baltimore, with children Herman Jacob, 19, crane operator; and Clara Caroline, 17. They were at the same address in 1935. John (Jack) G. Raitt was born on 29 January 1893 in McGregor, Clayton, Iowa and died in December 1979 in Vinton, Benton, Iowa. He was the third son of Charles W. Raitt and Esther Adney. John’s wife, Sadie Mae Likens was born on 9 August 1889 in Brandon, Iowa to Otis G. Likens and Anna Evens and died on March 1976 in Vinton. They had married at her home near Brandon on 27 August 1910 - the marriage extract shows that he was a 22 year old plasterer residing in Waterloo, Iowa, but had been born in McGregor to Charles Raitt and Caroline Adney. It was his first marriage. Sadie was also 22, residing in Vinton, and it was also her first marriage. Their son Byrl O. was born on 15 October 1911 in Brandon, Buchanan County, Iowa. and their son Louis Charles (“Touie”) was born 3 April 1913 in Waterloo, Black Hawk, Iowa. John, aged 30, subsequently married Hazel Marie Rodgers on 8 June 1823 in Vinton. In the record, his parents were named as Charles Raitt and Caroline Adney and hers were Frank Rodgers and Ada See. Hazel was born on 28 March 1895 in Clarion, Wright, Iowa and died on 21 September 1992 in Pella, Marion, Iowa. The couple had a daughter Pansy (Penny), born in 15 November 1925 in Iowa and who died on 20 August 1990 in Waterloo, Black Hawk, Iowa. She married Jack N. Mozena (1924-1988) in Fort Dodge, Webster, Iowa on 13 September 1945 and had a daughter, Jane. John (Jack) was drafted during the 1st World War - his address being given as Davenport, Scott County, Iowa, where he was working as a plasterer. He had a wife and two children. His draft registration dated 5 June 1917 describes him as medium hight and build, with blue eyes and dark hair. In the Iowa State Census for 1905, John Raitt is aged 12 residing in Clayton, Iowa. In the 1910 census for Waterloo Ward 3, Black Hawk, Iowa, living in Ricker Street we find John Raitt, 19, born Iowa, working as an attendant for a stone mason. He is the nephew of the head of the household Benjamin T. Jones whose wife is Mattie Lucy Jones, age 30. Looking up the marriage record she turns out to be Mattie Probert, i.e. Martha Prabert, born 1880, stepdaughter of Oliver Raitt (see above). In the 1915 Iowa State Census for Brandon, Buchanan, John Raitt, aged 23, married, is a brick mason. His father was born in New York and his mother in Wisconsin. His wife Sadie. M. is aged 24 , born Iowa (father in Illinois, mother in Michigan) and son Byrl O. is three; and son Louis C., is 2. In the 1920 census for Jefferson, Buchanan, Iowa living in Miller Street, we find Jack Raitt, 27, mason, born Iowa and wife Sadie, 29, born Iowa (father in Illinois, mother in Michigan) - also in the household are sons Beryl Raitt, aged 8; and Louis, 6 - both born in Iowa. The Iowa State census record for 1 January 1925 states that John Raitt, 32, born Iowa, is living with wife Hazel M., 29, born Iowa, in Tipton, Cedar County, Iowa. 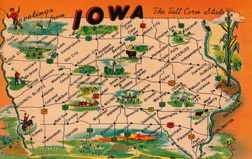 John’s father is given as Charley Raitt and his mother Esther Adney - both born in Iowa and married there. Hazel’s father is Frank Rodgers, age 64, born Wisconsin and her mother is Ada See, 51, born Iowa. They were also married in Iowa. In the 1930 census for Jefferson, Buchanan, Iowa is John Raitt, 37, mason, born Iowa (father Maine, mother Wisconsin) living at 50 Main Street with wife Hazel, 36, born Iowa (as parents). In the 1940 census for Harrison Township, Benton, Iowa we find John Raitt, 46, farmer, born Iowa; wife Hazel, 45, born Iowa; daughter Panzy, 14, born Illinois; and son Louis, 27, farm labourer. Living nearby is Byrl Raitt, age 28, farm labourer, with his wife Eleanor, 20; and son James, born Iowa. John William Raitt (this is the first time we learn his middle name was William - but what about the initial G.? George?) was registered for the draft on 17 April 1942 at age 48. His date and place of birth was given as 29 January 1894 in McGregor, Clayton, Iowa and his current residence was in Brandon, Benton, Iowa where he was a farmer. The person who would always know his address was (his wife) Hazel Raitt in Brandon. He was 5ft 9in tall, weighed 195 lbs, had brown hair, hazel eyes and a ruddy complexion. He also had a hernia scar. Byrl O. Raitt was born on 15 October 1911 in Brandon, Buchanan County, Iowa. He was the eldest son of John Raitt and Sadie Likens. Aged 26, he married Eleanor Healy Stein, aged 18, in Vinton on 13 Dec 1937. The daughter of Frank and Mirl Healy Stein, she was born on 2 Oct 1919 in Mount Auburn, Benton County, Iowa and died on 10 March 1993 in Vinton. They had one child - a son named Jack (James?). Byrl “Speed” Raitt died on 16 Jan 1999 in Vinton, Benton County, Iowa. It seems he was occupied as a gravedigger at the time of his death. Byrl’s son Jack and his wife Marsha had four children including three boys: Jack II, Mat Cory and Geoff Melia. 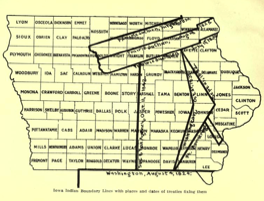 In the 1915 Iowa State census for Brandon, Buchanan, Iowa Byrl O. Raitt, is three - both parents were born in Iowa. In the 1920 census for Jefferson, Buchanan, Iowa we find Beryl Raitt, aged 8, in the household of his father Jack Raitt, 27, mason, and mother Sadie, 29 - also there is their son Louis, 6. 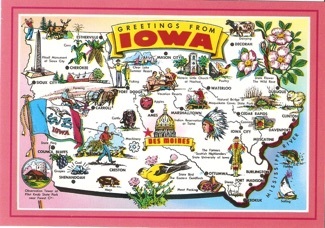 All born Iowa (Sadie’s father was born in Iowa and her mother was born in Michigan). In the 1930 census for Harrison Township, Benton, Iowa, Byrl Rate, 18, born Iowa, is a lodger and labourer on a general farm belonging to Walter Pardun. In 1938 Byrl O. Raitt and wife Eleanor were residing at 3728 SE 17th Avenue, Portland, Oregon. His brother Louis is residing at the same address. In the 1940 census for Harrison Township, Benton, Iowa, Byrl Raitt, age 28, farm labourer, is living with his wife Eleanor, 20; and son James, born Iowa. Living nearby is his father John Raitt, 46, farmer, born Iowa; wife Hazel, 45, born Iowa; daughter Panzy, 14, born Illinois; and son Louis, 27, farm labourer. John Raitt and Sadie Likens had another son, Louis Charles (“Touie"), born 3 April 1913 in Waterloo, Black Hawk, Iowa. Louis died in Vinton, Benton County, Iowa on 8 January 1998. He married Maxine Evans at Rock Island, Illinois on 17 March 1941. Maxine was born on 10 March 1922. According to his obituary after enlisting in the army in 1934 where he served as Honour Guard to General MacArthur in the Philippines and being discharged in 1937, Louis learned the masonry trade from his father, John. He established his own masonry company and worked on several local buildings including the Benton County Courthouse and the Braille School. Louis and Maxine had three children: sons Terry and Tom and daughter Lynette. Terry was born on 31 January 1942 in Vinton and died there aged 74 on 29 September 2016. He learned masonry skills from his grandfather Jack Raitt, and also his father, Louis in the family business Raitt Construction. Terry married Sherry Kiesel on 4 October 1964 in Vinton and they had a daughter named Chela. Tom married Heidi, born 7 March 1966. In the Iowa State Census for 1915, Louis C. Raitt is 2 residing at Brandon, Buchanan, Iowa. Like his parents he was born in Iowa. In the 1920 census for Jefferson, Buchanan, Iowa, Louis Raitt, age 6, born Iowa, is living in Miller Street with his father Jack Raitt, 27, mason, born Iowa; mother Sadie, 29, born Iowa (father in Illinois, mother in Michigan); and brother Beryl, aged 8, born Iowa. In the 1940 census for Harrison, Benton, Iowa, we find Louis Raitt, age 27, single, born Iowa, occupied as a labourer. Also in the household is his father, John Raitt, 46, farmer, born Iowa; mother, Hazel, 45, born Iowa; and sister Panzy, 14, born Illinois. Living nearby is brother Byrl Raitt, age 28, farm labourer, with his wife Eleanor, 20; and son James, born Iowa. They had all been resident on the farm in 1935. In 1945 Lewis C. Raitt and Maxine I. Raitt were living at 607 12th ave SE. 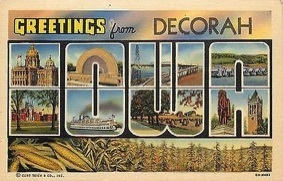 Cedar Rapids, Iowa. Lewis was a factory worker at the LaPlant-Choate Mfg Co.
Ellwood Charles Raitt was the son of Charles W. Raitt and his second wife Francis Allie Hughes whom he married on 28 May 1902 in McGregor, Clayton, Iowa where she had been born in October 1864. Ellwood was born on 31 January 1904 in Clayton and died in St Louis County, Minnesota on 13 November 1967. He married Lula Dolores Knudsen, the daughter of Alfred Knudsen (born Denmark) and Alma (born Sweden) probably in Minnesota between 1920 and 1926. Lula (various spellings) was born on 17 November 1906 in Minnesota, and died on 19 December 1988 in Duluth, St Louis, Minnesota. Their son Ellwood Allen Jnr was born there on 2 July 1927 and died on 5 February 1996 in Duluth. They also had a daughter, Carley, born in Duluth in 1934. Despite his parents and sibling being in the 1910 census, Ellwood is not found with them or elsewhere at present. In the 1915 census for McGregor, Clayton, Iowa, is Elwood C. Raitt, 11, born Iowa. Also there is Frances A. Raitt, 50, born Iowa (father born Pennsylvania, mother Delaware). Ellwood is not yet found in the 1920 census, though wife-to-be Lula, 13, is at home with her parents and siblings in Duluth. In the 1930 census for Normanna, St Louis, Minnesota living at 37 Fox Farm Road we find Ellwood Raitt, 26, farmer, born Iowa (father Iowa, mother Pennsylvania); wife Lulu, 23, (married at age 18), born Minnesota (father born Denmark, mother Sweden), and son Allen, 2, born Minnesota. Living next door at no. 36 Fox Farm Road are Lulu’s parents and family. In the 1940 census for 3422 West Firth St, Duluth, St Louis, Minnesota is Elwood Raitt, 36, attendant at a filling station, born Iowa; wife Lula, 33, and children Allen, 12 and Carley, 6 - all born Minnesota. They had been at the same address in 1935. In 1946 Ellwood C. Raitt and spouse Louela D. Raitt were residing at 2951 Exeter, Duluth, Minnesota. Ellwood was a pickler. In 1957 and 1958 Ellwood and wife Loula D, were living at 6019 Tioga, Duluth and Charles was still a pickler. According to his obituary, Ellwood Allen Raitt, son of Ellwood Charles Raitt and Lula Knudsen, was a lifelong Duluth resident and worked at the U.S. Steel plant before joining the Army. After his Army service, he worked in shipping and billing at the Elliott Meat Packing Co., retiring in 1986 after 39 years of service. He married Betty Marie Doyle on Jan. 19, 1948, in Duluth. 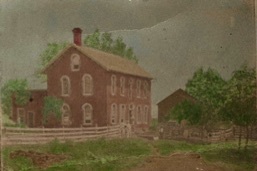 Ellwood and Betty had two daughters: Sandra M. and Kathleen A., and two sons: Daniel A. and Michael D.
The picture above at right is apparently a penny postcard of the Raitt's home on Pleasant Ridge Road, rural McGregor (80 acres in Section 4) in the early 1900s. The house no longer exists. (From June Adney Larson's collection).